The most awaitied movie of the year! The most expensive movie ever made! So lets get to 2154.. and i wonder if im watching a movie or a video game (first thought). But as time progressed i was definitely into the movie. 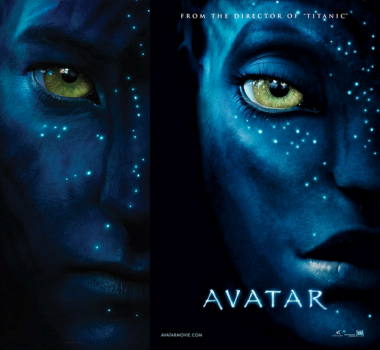 Please do not compare this with any of James Cameron movie. No Titanic No Terminator. This movie making is a whole new tangent compared to any of his movies. One thing – It is a feast to the eyes to watch the visuals. Its just takes to a place far far away from the time you watch with those glasses on. Theres not much story in the movie that we havent witnessed in the previous makings. Humans try to take over a place named Pandora which is the home of these blue, tall and big eyed aliens and also home to the most precious minerals that the humans want to take. Thinking about the aliens and not hurting them is their least priority. On the other hand, these aliens are humans – just that they differ in appearance (goes without saying) and thinking. They want to conserve natu re, very spiritual and believe in their ancestors (Eywa). How the humans try to take over the minerals and how the Navis (Aliens) try to safegurad their home is the story. Usual right! Jake is the man who is wired in a machine and sent to be a part of this clan and learn all about them. So he meets Neytiri who teaches all about them, their ancestors and even to fly his own creature-bird. To ride this creature he needs to plug some thing thats is at the end of his hair with the creature to feel it and make it do want he wants. So as days go by, Jake and Neytiri fall in love (expected) and he wants to be the alien (and not human anymore) as he becomes part of “The(ir) People”. Jake already knows the plan of the humans and so he tries to save the aliens from the upcomings but things turn out the other way. After a lot of struggle and escaping, he makes sure he does something bigger than big for the aliens to believe him and help him in saving them. The struggle between the humans and all the aliens is the time you wouldn’t move your eyeballs a second as the visuals again are just as breath taking as it can get and it just envelops you in the excellent and mind blowing 3D effects. The acting is just perfect, few scenes a little draggy and has Lord of the ring flavour in it. A must watch. Go with no expectations – just feel the music, treat your eyes with the visuals as these kind of movies come only once in a while and i’m sure this will give you one hell of a experience. PS – If anyone said don’t watch this, they just don’t know how to enjoy different movies!!!!! Hey Preethi, Great to see your review…Will checkout the movie for sure. Good job with this attempt of blogging and good luck!! Good one! Updated your blog after a long time, I see. Will be watching it tomorrow. Yo, it was the best movie of the year!! Hi Preethi, Good write up.